This book is a study of Cuba's economic development under communism over the last fifty-five years. The authors find that Cuba's socioeconomic development has gone backward since the Cuban Revolution in 1959. The authors conclude that Fidel Castro's revolution has been an economic disaster for Cuba. 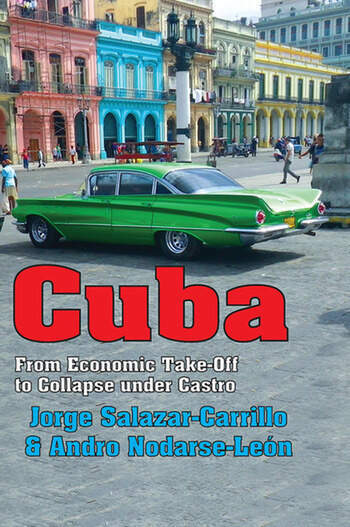 The book first outlines Cuba's economic position prior to the revolution. It reviews Cuba's rankings with respect to Gross Domestic Product (GDP) per capita in the 1950s and examines the strength of pre-Castro Cuba's foreign reserves and the health of its monetary system. It also presents pre-Castro Cuba's investments in health care and education and documents the island's development potential in the 1950s. The last few chapters describe the precipitous decline in all of these areas of Cuba's economy under Castro. Despite the socioeconomic catastrophe of the Castro years, the authors envision a post-Castro Cuba, where this book can provide a benchmark to measure the developmental success that the Cuban work-ethic and entrepreneurial spirit can generate in a free-market system.